Almost to Yosemite and I need coffee, hubby needs food. 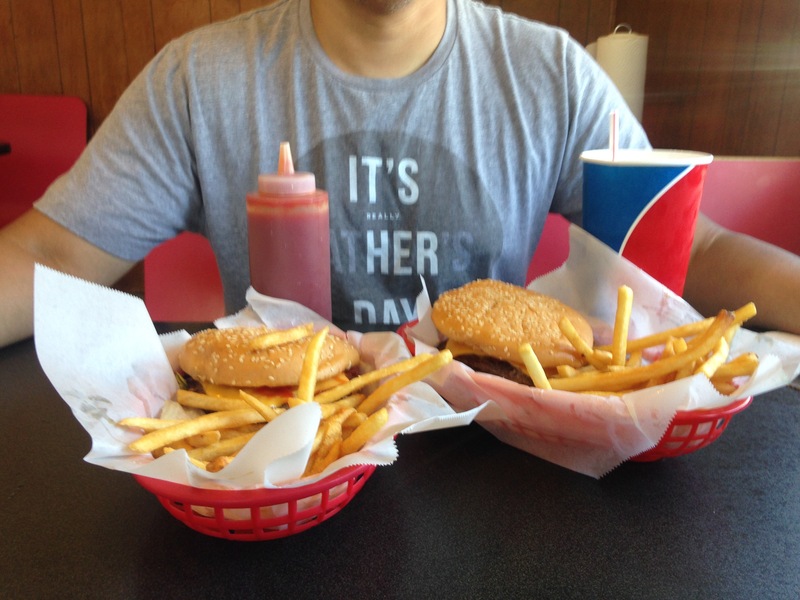 We kept up with the no chain resturant rule and stopped at Pete Place in Oakhurst. 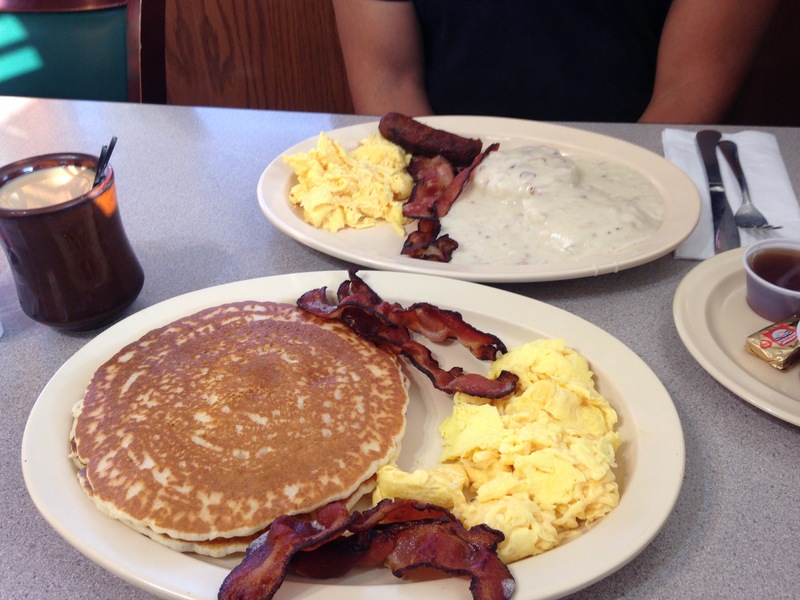 I choose eggs bacon and pancakes. Hubby got eggs biscuits And gravy. Yummy! If you’re hungry this is the place to come. Hubby who doesn’t eat pancakes actually finished mine. My favorite part of this place is when each customer came in they knew their name and what they wanted. So friendly to us outsiders too. If you don’t stop here you will regret it! Say hi to Misty and Laura when you do. Now to head to the park and do some hiking and work this breakfast off. Google maps says 3 hours 39 minutes to our camp ground. The weather should be mild, high of 84. I’m looking forward to riding my bike around, picnicking for lunch and seeing the stars tonight. The benefit of being Shotgun Rider is I’m going to sleep. Nothing to see and I’m not used to getting up this early. See y’all in a few hours! I have less than 24 hours to plan an overnight trip to Yosemite. I’m bringing my bike, a tent and sleeping bags, toiletries, change of clothes, towels and swimwear and not much else. Oh can’t forget hubby, how else can I ride shotgun. This will only be my second time in Yosemite and last time I was too much in awe to really take it all in. 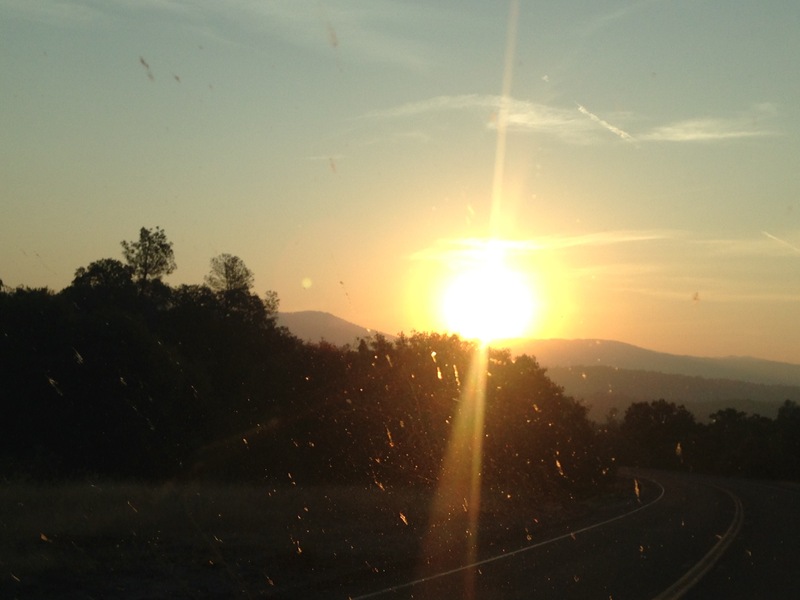 We will be camping at the Wawona Campgrounds. Check that one off my bucket list. My husband has a supply of MRE’s (military meals ready to eat). We will be surviving mainly on those MRE’s. Ok maybe a few other items but I’ll try to eat my MRE. I’ll look for the chicken ones. Our trip begins 4:00am Sunday August 21 st.
My go bag consists of items and clothes I would need for a quick overnight getaway. I bring it on long trips too because sometimes you don’t want to drag everything out of the truck. I’ve changed the actual bag a few times but now it is consistently my army green backpack with law enforcement patches that I’ve sewn all over the front. I collect the patches on my trips. It has a small front pocket and two inside pockets. Travel size toiletries in a ziplock bag. (Don’t forget personal items since you never know) This includes a small brush, tooth brush, sunscreen, razor and a washcloth. Usually a small amount of make up too. A few protein bars or snacks that will last a while. Reusable water cup. If you wear glasses or contacts, take medications be sure to pack that too. That’s the basics of my go bag. It’s amazing what you can go without. It’s about the quick getaway. It’s fun to not have plans and wing it. You’ll find what you can’t travel without and what just never gets used do you stop bringing it. Your go bag is personal for you and is always evolving. Just as we as humans are evolving. 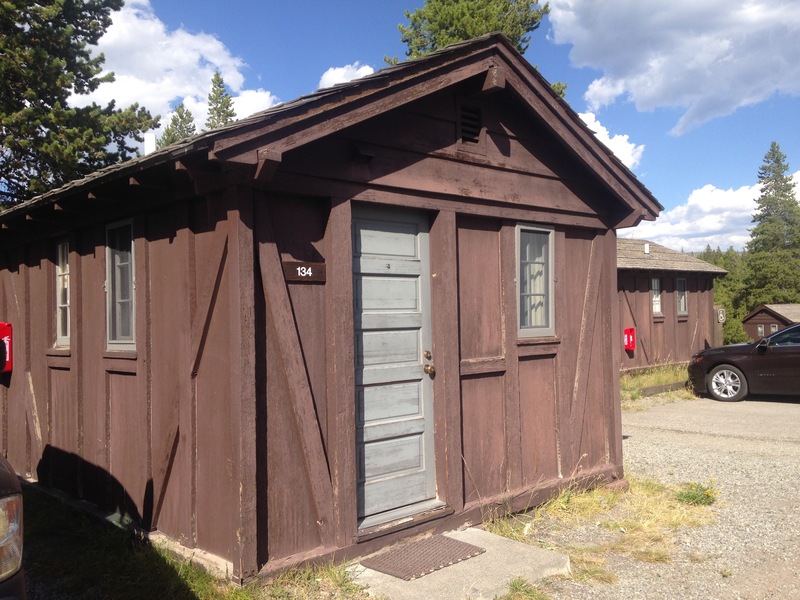 I thought for sure my late booking of Yellowstone cabins meant crappy room. OMG we had the cutest cabin with out own sink, shower and toilet. I lucked out because I had know idea how hard it is to rent. See below for a picture of the cutest cabin, bear proof too. 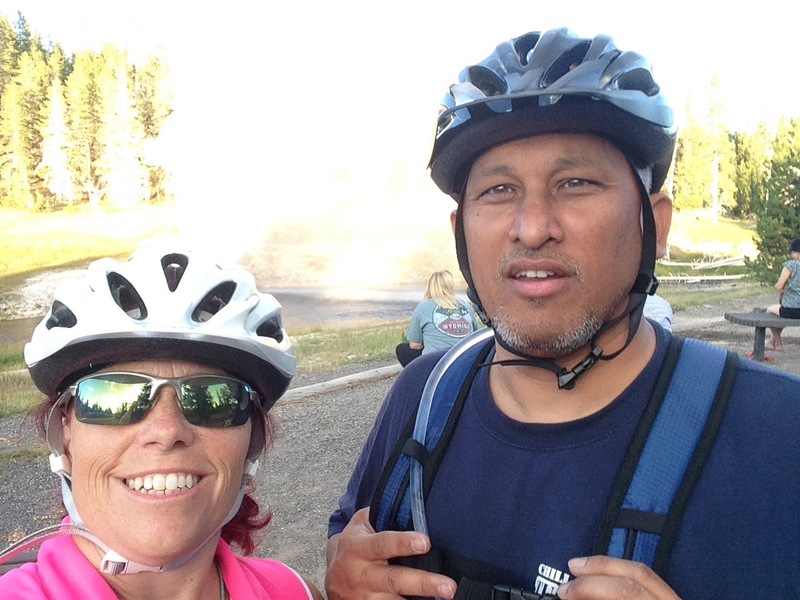 We rode our new bikes around checking out the geysers. I only fell twice. 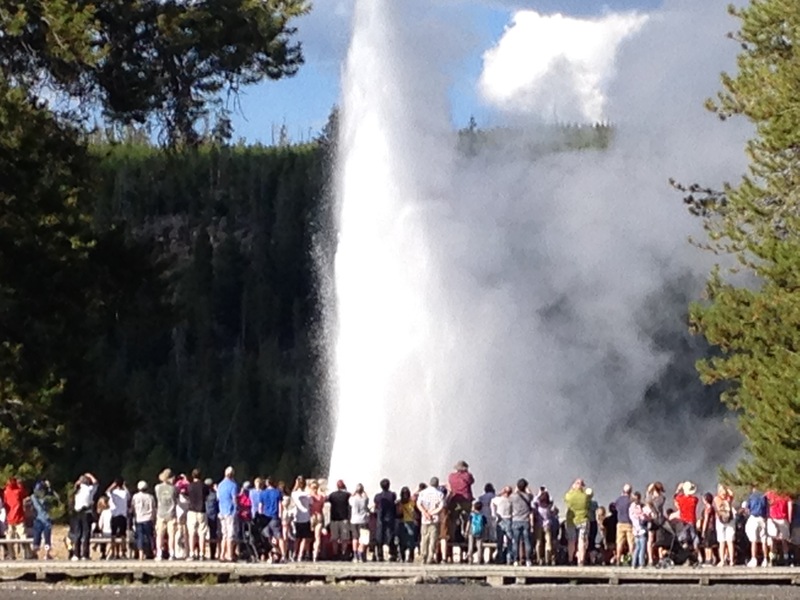 We sat back from old faithful instead of on the benches up close. 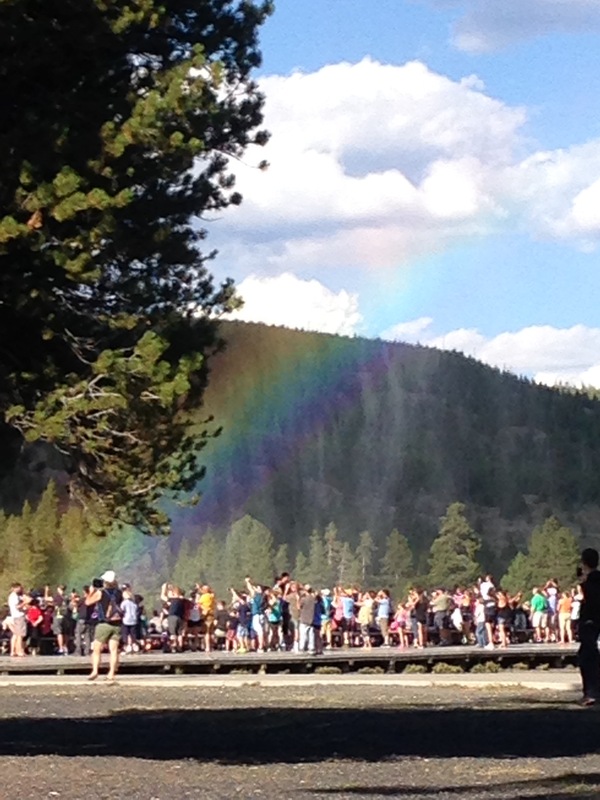 Not only did it get a spectacular view of the geyser but I caught a rainbow in the mist. 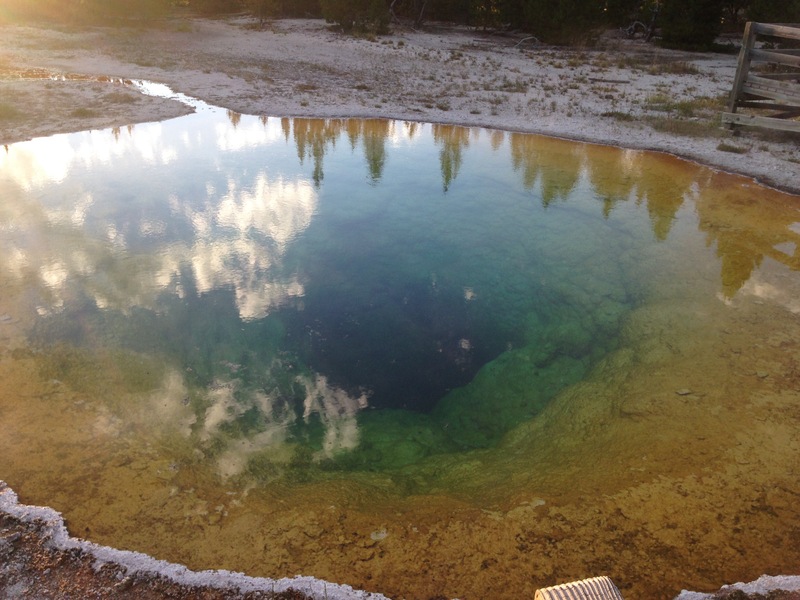 Below is my favorite geyser, Morning Glory. So clear and colorful. Unfortunately humans have been throwing items into the geyser and the brilliant colors are fading. They try to clean it out regularly but really people, how about we just do the right thing for a change huh? I’d like my great great grandkids to visit this sometime in the future. Unfortunately we have been driving so much from place to place we haven’t got to ride except for 1 day around old faithful. There were a ton of smaller geysers to be seen in that area and it was an easy bike ride. 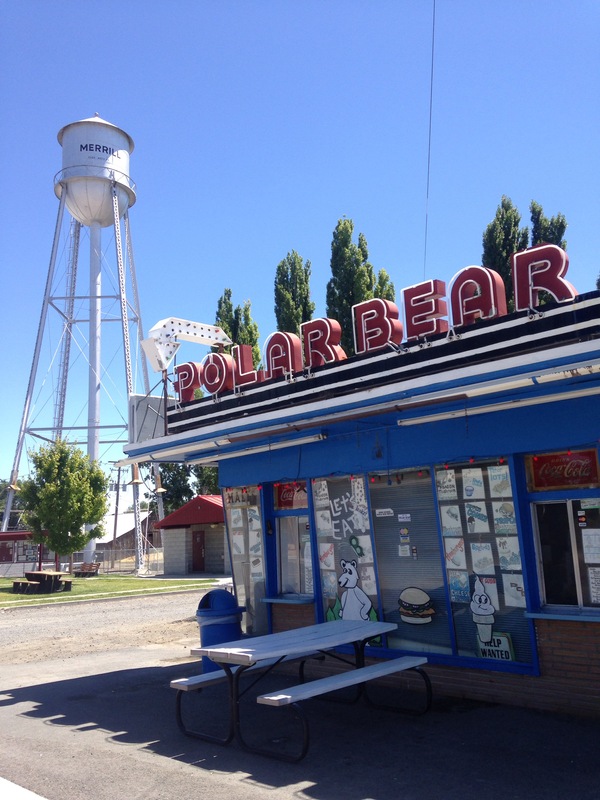 We camped out the following night and I was so afraid of bears I packed just about everything in the bear box. My night time wish was to see no bears on this leg of our trip and thankfully it worked. We did take a hike around the mud volcanos ​and other geysers. 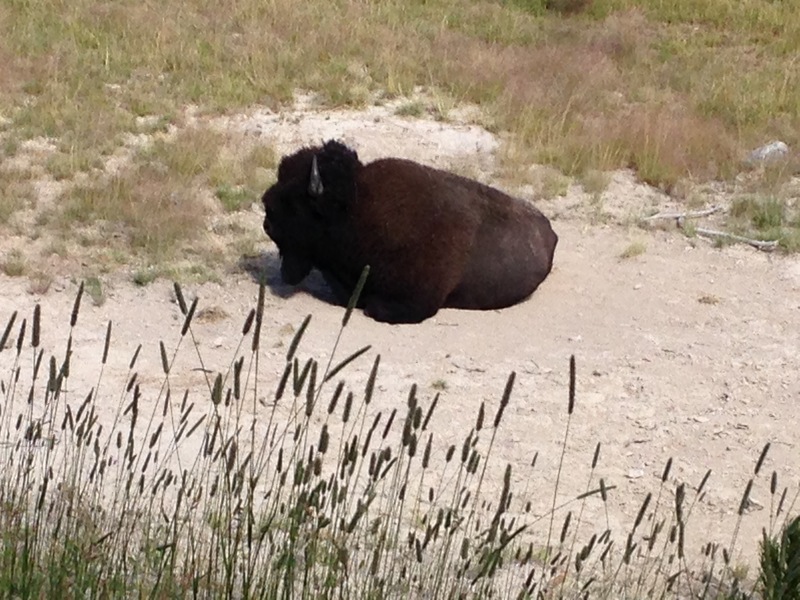 ​I was rightfully reprimanded for being too close to the realife dangerous bisson/buffalo. Apparently they can move pretty fast so my 15 feet away was just stupid. Good picture though. Not one of my smartest moves and I don’t suggest you get this close, EVER! We kept driving north and stopped at the water falls. Feeling the surge of energy was exhilarating and frightening all at the same time. I watched countless times as park visitors walking over barriers stepping close to wild animals intentionally, doing this was extremely dangerous. Including when I stopped to take the biasson picture instead of walking quickly away. Again not my smartest move on this trip. Please remember even though these animals look calm they are wild and can cause major if not fatal harm to you and your children. Respect their instinct to protect and kill anything they think may cause them danger. When my boys were little we would go to the zoo nature trail. My favorite answer when they asked if the animals would bite was always if it has teeth, it bites. Stay safe enjoy the animals from a distance. Stay tuned and don’t forget to enter your email to get alerts on my new posts. 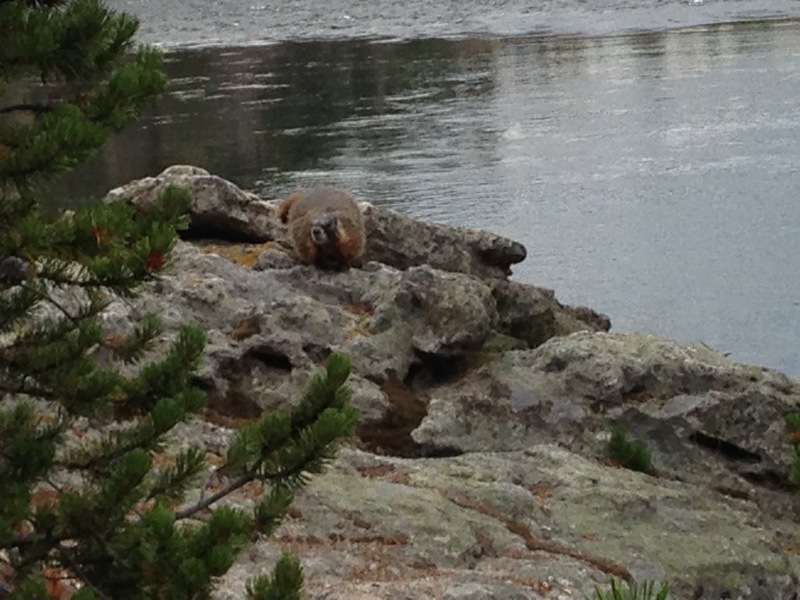 When packing up to leave Yellowstone, I chatted with a fellow camper about traveling and our next destination, Mount Rushmore. 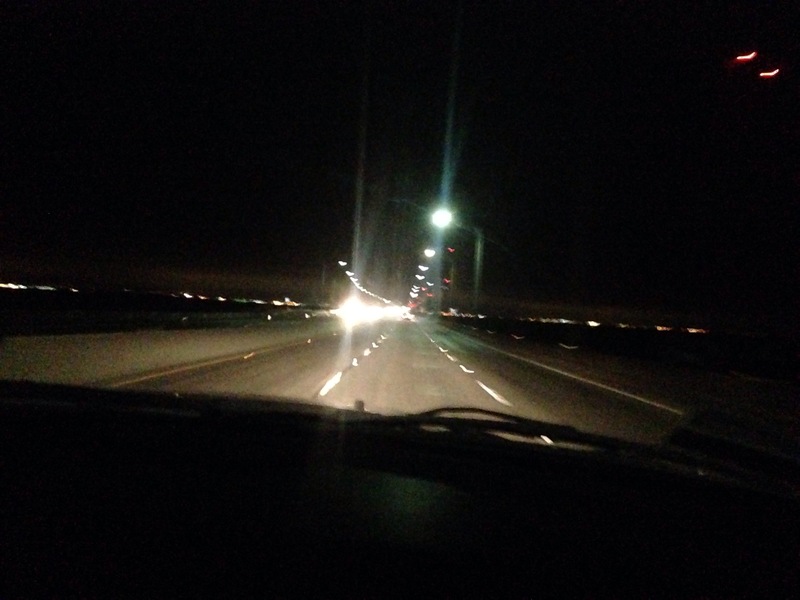 He told me about how special seeing it at night was all lit up. I was sad to think I would miss it. I didn’t miss it though. 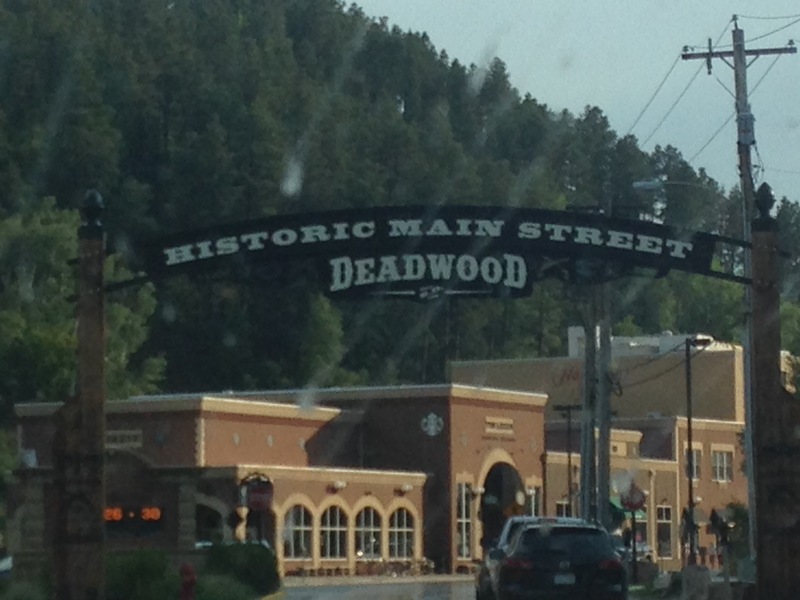 We drove through Wyoming, stopping in Deadwood for a brief 45 minute break and headed south to the memorial. We arrived in Keystone, a quaint old town in South Dakota around 8:30. I couldn’t wait to see Mt. Rushmore so this towns explorations would have to wait until tomorrow morning. Amazingly, like it was meant to be, we pulled into a parking spot and walked into the memorial with time to spare. BTW It was only $11.00 for an annual parking pass, there is no individual admission charge after you pay to park. Back to the night lighting ceremony. We entered passing tall pillars with each state flag. Upon reaching the top observation area the speaker began giving information about President Roosevelt. For twenty minutes a soft voice spoke of the history of each great man depicted in stone. In almost complete silence the lights went on and the mountain was aglow. Honestly I heard the crowd gasp as we all took in the greatness and amazing site before us. It was breathtaking, and to think I almost missed it. I headed down the side stairs to explore and was stopped in my tracks. All military members current and retired were asked to come on stage. The park ranger acknowledged and thanked the group for their service. Next the ranger asked for assistance in lowering and folding the American flag, again the crowd remain silent during this ceremony. My favorite part of the night was when each military personnel was asked their name and the branch of service they represent. I was honored to see each man and woman, young and old, stand tall and proudly announce who they are and their branch. I loved when instead of simply saying “Navy” “Marines” or “Army” they would say “UNITED STATES MARINE CORP!” or “US ARMY”. Of course lots of Oorah! and Hooah! Just thinking about the freedoms I have thanks to our military choked me up a bit. 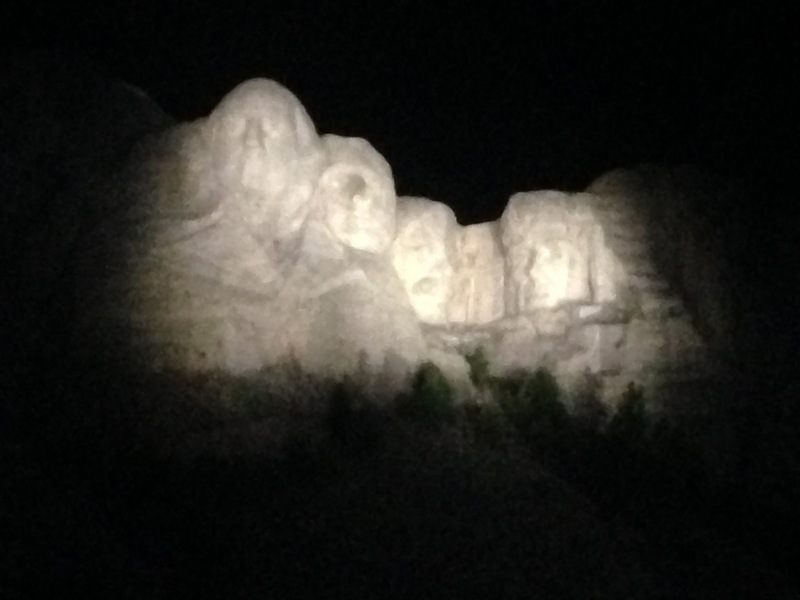 So glad I got to see Mt Rushmore at night thanks to my open nature and ability to have friendly conversations with strangers. That’s why hubby calls me the ambassador. I love smiling and talking, you never know what you might miss out on if you stay quiet. Next blog Mt Rushmore during the day.